The New York-based newspaper ran a story headlined ‘Trump Meets India’s Leader, a Fellow Nationalist Battling China for His Favor’ calling both leaders ‘nationalist’ with a shared passion for social media. At the same time, it expressed concerns that India might have with Trump perhaps showing less interest than his predecessors. “Yet the mutual admiration masked a more complicated dynamic between India and the United States. While ties between the two have grown steadily closer over the last two decades, India faces new uncertainties with Mr. Trump, who has shown less interest than his predecessors in maintaining a web of trade and security alliances in Asia. India, like other countries in the region, has watched Mr. Trump’s cultivation of Mr. Xi with concern. His trade and immigration policies, particularly limits on visas commonly used by technology workers from India, have added to the jitters, as did his decision to pull out of the Paris climate accord,” it said. The piece also explains India’s need to deepen ties with the US in the face of a resurgent China that seeks to play a bigger role in the south Asian region where India has displayed dominance over the years. “Though India is traditionally wary of military alliances, the two countries have explored ways to create a naval network that would balance China’s maritime expansion. Among the proposals are joint naval patrols in the South China Sea, an idea India has so far rejected,” the article says. An article in this newspaper focused on the fact that no questions were taken during the joint press briefing of PM Modi and President Trump in the Rose Garden even though they were leaders of the oldest and largest democracies. 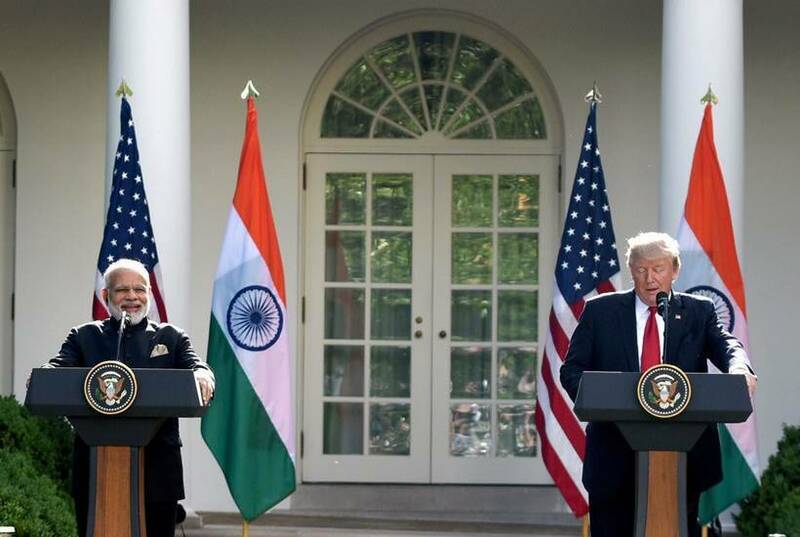 “It might have worked out well for Trump and Modi, who each have more than 30 million followers on Twitter, but not so much for the several dozen reporters from the United States and India who were seated in rows of folding chairs under a warm late-afternoon sun. The journalists were told ahead of time that there would be no questions allowed — a break from the typical Rose Garden tradition of two questions from each press delegation,” the article said. The piece said reporters were barred from asking questions even as there were important developments in the US on the Supreme Court’s partial nod to the travel ban and the possible impact of the repeal of Obamacare. It was not clear on whose insistence questions from reporters were not taken. The article also went on to mention that contentious issues like the US pulling out of the Paris Accord and the possible action on H1B visas were not discussed during the talks. Some of the topics that could headline the agenda are immigration, terrorism and regional security, China and trade and defence, the paper noted. “India is not in Trump’s crosshairs like Mexico. But in April, Trump fired a warning shot by announcing a review of the H-1B visa program under which up to 65,000 skilled workers — many of them computer engineers from India — enter the U.S. annually,” the article said. It also quoted senior officials saying the US President would look to treat India like the defence ally it is.